I am an assistant professor of Electrical Engineering and the Andlinger Center for Energy and the Environment at Princeton University. I lead the Princeton Power Electronics Research Lab (Princeton PowerLab). You can find my Google Scholar Page & CV here. 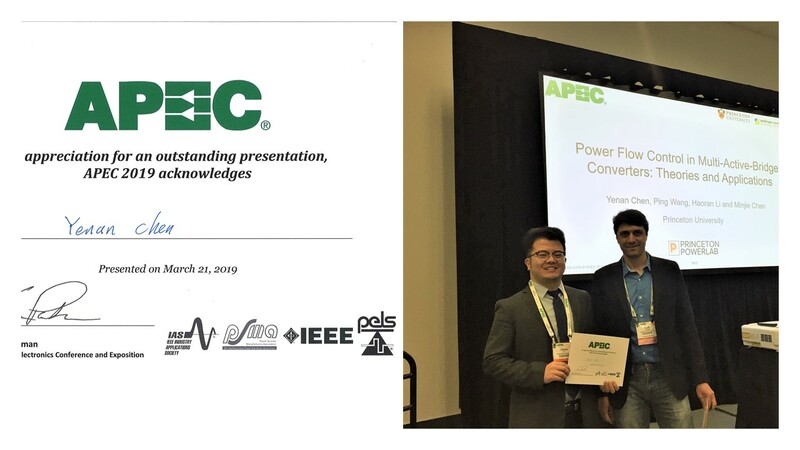 Award: Yenan Chen won the Outstanding Presentation Award in APEC 2019! 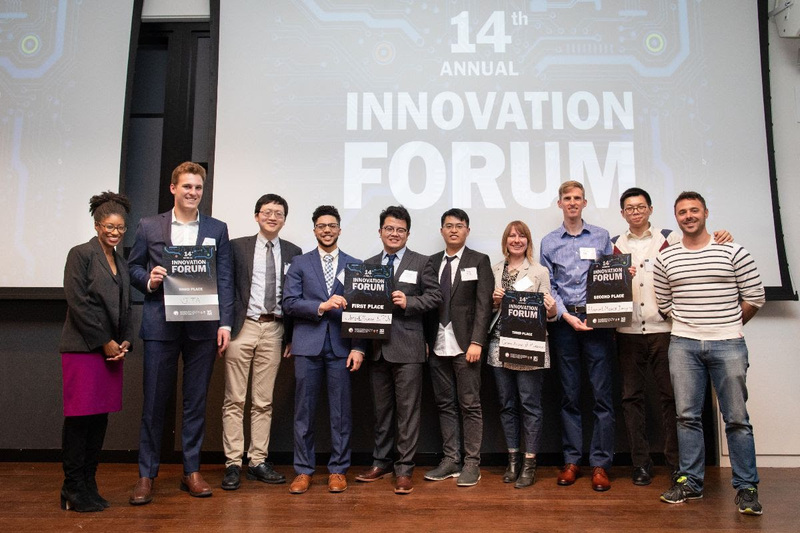 Award: PowerLab won the First Place out of nine teams in the 2019 Princeton Innovation Forum with our research on Ultra Efficient Energy Processing Unit (EPU) for future data centers. Big congrats to Yenan Chen, Youssef Elasser, and Ping Wang! A new venture starts! 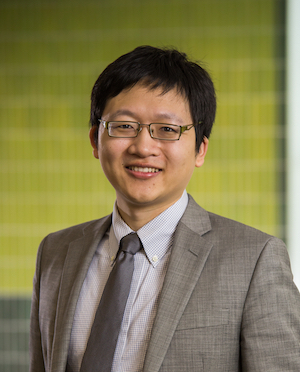 Award: Prof. Chen received the NSF CAREER Award for his proposal ‘‘Granular Power Electronics at the Grid Edge". More interesting research coming! Dr. Jaeil Baek joins Princeton PowerLab from KAIST. Welcome, Jaeil! Award: Prof. Chen's proposal on 48V-1V point-of-load power converter wins Princeton SEAS Innovation Grant. Award: Prof. Chen's journal paper - “Multitrack Power Conversion Architecture” - wins the 2nd Place Prize Paper Award from IEEE Transactions on Power Electronics in 2017. This is the second journal prize paper award from Princeton PowerLab! Dr. Yenan Chen joins PowerLab from Zhejiang University. Welcome, Yenan! Proposal: Prof. Chen's proposal as a PI “Multi-Input Multi-Output (MIMO) Bi-directional DC Power Delivery Architecture for Smart Homes” was selected for funding by Princeton E-ffiliates Partnership. Proposal: Prof. Chen's proposal as a co-PI “Engineering the Invisible: Probing the Limits of Solar Powered Com-Towers” was funded by American Tower through Princeton Andlinger Center. Patent: Our new patent “Switched-Capacitor Split Drive Transformer Power Conversion Circuit”, US patent No. 9,825,545 (with Prof. Khurram Afridi at and Prof. David Perreault) was issued on Nov. 21, 2017. More innovations coming! Seminar: Prof. Chen gave a speech about Transporation Electrification at the Andlinger Center E-ffiliates Annual Meeting. Lots of opportunities for power electronics in EVs and Transportation Electrification! Publication: Prof. Chen's paper - “A switched-winding transformer with low quiescent loss to meet the level VI efficiency standard at high power density” - was published at IEEE ECCE. Dr. Ming Liu joins PowerLab from University of Michigan and Shanghai Jiao Tong University Joint Institute. Welcome, Ming! Proposal: Prof. Chen's proposal as a co-PI - “Extreme Efficiency 240 VAC to Load Data Center Power Delivery Topologies and Control” - was selected for funding by DOE ARPA-E as part of the CIRCUITS program as a three-year project. This project is in collaboration with Prof. Robert Pilawa-Podgurski's at University of California Berkeley. Fida Niway joins PowerLab as an undergraduate working on his senior thesis about wireless power transfer. Welcome, Fida! Proposal: Prof. Chen's proposal as a co-PI - “Electrification of Transportation for Energy Storage and Smart Mobility” - was seleted for funding in a recent Call for Proposals for Innovative Research in Energy and the Environment from Princeton Andlinger Center. Award: Prof. Chen's journal paper - “A Systematic Approach to Modeling Impedances and Current Distribution in Planar Magnetics” - wins the 1st Place Prize Paper Award from IEEE Transactions on Power Electronics in 2016. This is the first journal prize paper award from Princeton PowerLab! Media: Abdul, Alex, and Fida's research on solar powered wireless charging platform for drones was featured on Princeton SEAS Webpage. Ping Wang joins PowerLab from Shanghai Jiaotong University. Welcome, Ping! Publication: Prof. Chen's paper - “Magnetics Design and Optimization for Tapped-Series-Capacitor (TSC) Power Converters” - was published at IEEE COMPEL. Abdulghafar Al Tair, Alex Ju and Fida Newaj join PowerLab. Proposal: Prof. Chen's proposal - “Developing a Smart Energy Router for Flexible and Efficient DC Power Distribution in Smart Homes and Buildings” - wins Siebel Energy Institute 2017 Research Grant. Page generated 2019-03-25 11:37:29 EDT, by jemdoc.